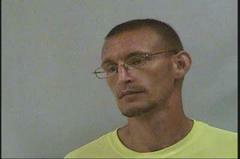 McDowell County Sheriff’s Office investigators are on the hunt for a wanted felon. Detective Paul Alkire charged 29-year-old Mathew Cordarro English, whose last known address was 356 Sam Bradley Gap Road in Old Fort, with larceny of a motor vehicle but has been unable to locate him. English is accused of stealing a white 2005 Nissan Altima, with N.C. tag CJC-1086, from the Marion home of his ex-girlfriend, Tera Brown, on Feb. 17. He is believed to still be driving the Nissan. He is described as a white male who stands 5 feet, 11 inches tall, weighs 193 pounds and has brown hair, hazel eyes and various tattoos on both arms, both hands, his neck and his chest. Anyone with information concerning English’s whereabouts is asked to call the Sheriff’s Office at 652-2235, the 911 communications center at 652-4000 or McDowell County Crime Stoppers at 65-CRIME. You can also text your tips to Crime Stoppers. Text MCDOWELLTIPS and your information to 274637 (CRIMES). With Crime Stoppers, your identity remains anonymous, and you could receive a cash reward.